Dashmate Mobile App was developed for a largest logistics and carrier service provider to monitor the real time activities of drivers. The client needs a mobile app to track their driver behaviour and get details on delivery schedule of transported goods. They wanted a web client to monitor all real time activities of drivers such as rest, work, goods loading and unloading time, etc. In addition, they preferred to integrate their existing ERP system for tracking the driver’s details, goods pick-up and delivery details. 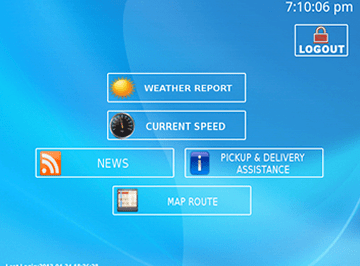 The mobile app should be user friendly even for drivers who don’t have good computer knowledge or using mobile applications. They want the mobile application to work in different platform and devices. We at ANGLER developed a mobile application using Mono framework which supported both Android and iPhone. Our team of mobile app developers has built a web based client application which receive updates from the ERP system and as well asMobileapplication. The web application serves as an interface between theMobileapp and existing ERP servers. The web client admin can manage instructions to the drivers, PDF documents which has to be displayed in the mobile app, news feeds, pre-trip questions to the drivers, etc. The web client has a reporting module where they can view the rest and work details, work breaches, goods movement. The mobile application has the driver activity details. In case a driver breaches the law or fails to follow the driving patterns, it can also be tracked. The drivers can login and update the goods pick up and delivery details and can also view location / route using map interface. Besides, they can also have facilities to view various other instructions uploaded in the PDF from web client. The mobile app is seamlessly integrated with GPS, so that the tracking of vehicle is made easy. Automatic detection of check-in and check-out are enabled for easy use of application. Client can pass important message to the driver in case of any emergency or change in the pick-up / delivery schedule.